I am so excited about the holiday season this year! I can't wait to spend Christmas with my in-laws (!) and their extended family, and then celebrate my favorite holiday, ringing in the New Year, with my entire family. Happy holidays! May the new year bring you love and health, and above all, happy times with your families. P.S. 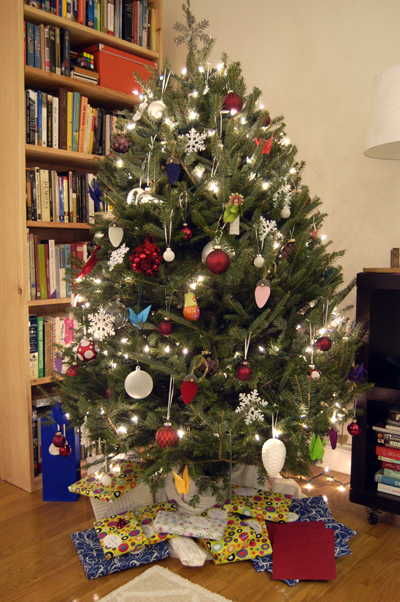 The world did not end, which is good news because we didn't wrap all those gifts for nothing! When looking for a house, it's useful to sit down and make a list of your must-haves and nice-to-haves and talk about the neighborhoods and schools and price ranges. But it's not until you start going to open houses that you actually begin to figure out what it is you REALLY like and what you absolutely cannot stand. At least, that's what we are learning in our house hunting process. We connected with a realtor at the end of September and quickly came to the realization (which I was mostly trying to be in denial about) that our $300,000 target price would not get us much in the neighborhoods where we've been looking to buy. So we cautiously expanded our price range to $350K, which was like a drop in the bucket in this real estate market, but at least some houses now appeared on our radar (though not many, and not very appealing ones, I assure you). After upping our budget, we decided to start checking out open houses to see what we could actually buy for that money. The first house we saw was at the upper end of our range, and looked beautiful on the listing photos. That's because the owner of the house who took theses photos turned out to be a photographer (there was even a dark room in the basement). So the first lesson we learned was: don't trust the listing photos! Especially those taken with a wide angle lens in order to make tiny closet-sized rooms appear larger than life. This particular house actually had four bedrooms (we are looking for 3), but they were tiny. And it was during this open house that I realized how much I hate low, slanted ceilings that are unfortunately so common in this area. They make me feel claustrophobic. Also, this house boasted one bathroom and it was on the second floor. Which is apparently also not uncommon. This makes me wonder who designed these houses. Four bedrooms and ONE bathroom, on the SECOND floor? I'm not even going to talk much about how this house (and numerous other ones on the market) boast as many different flooring options as there are rooms. It's becoming a familiar site to see hardwood flooring in one bedroom, disgusting carpeting in other bedrooms, hardwood in the hallway, linoleum in the kitchen, unidentifiable flooring in the office. Flooring does not bother me much because it's a doable project to replace carpeting with hardwood floors (which we love) that we can undertake ourselves. But I did learn right away that the layout of the house is very important. I would love to have a big, open space in the kitchen/dining/living room area, and in most of the houses we've seen so far, my first thoughts were usually about tearing down some walls. Anyway, we didn't fall in love with the first house we saw (I was worried about that possibility for a while). This was partially due to the claustrophobic ceilings, but my biggest problem was actually with the neighborhood. It was in the more affordable part of town, and we were seriously considering it (and frankly, it's still on our list), but I did not feel safe walking around those streets, even in broad daylight on a Sunday. Which just goes to show you that the second lesson we learned was: take a walk around the neighborhood! You can assume all you want about the benefits of the urban environments and presence/absence of public transportation, but until your feet hit the pavement, you will have no idea about the actual vibe of the neighborhood, and how you feel about it. This was actually a very valuable lesson for us because we decided to explore other neighborhoods that we had not previously considered. The next open house we went to was in a micro-neighborhood of a nearby city that turned out to be very charming. The house itself was within our budget, but it was a complete disaster. It was a true fixer upper in the full sense of the word. The house reeked of smoke, an odor that had been absorbed by the carpeting and the wallpaper over many years. There was water damage on the ceiling. The kitchen had not been updated in decades, which actually would have been totally fine with us if that was the biggest issue. It was not a big house, but it had three bedrooms and two full bathrooms, including, thankfully, one on the first floor. Despite all these flaws, the real deal breaker came when we took a look at the windows. They were... duct taped. We imagined a New England winter with duct taped windows, and I did some research on how much it would cost to replace them (we had no delusions about being able to DIY this particular repair), and we quickly realized that the cost of repairs necessary just to make the place inhabitable would be way too high. The fixer upper became unaffordable. So the third lesson we learned was: be realistic about your DIY abilities! We kept saying that we wanted to buy a fixer upper, but turns out what we really meant was that we would be up for putting down new hardwood floors and tearing down wall paper and making over the kitchen, but structural repairs were way beyond our presumed level of expertise (I say "presumed" because we haven't actually done any of these things, but we are willing to try). So maybe we should stop calling our future potential house a fixer upper, and agree that what we are actually looking for is some old-house charm. And speaking of old houses and charm, we visited another house on the same day that we saw the fixer upper. The two houses were so different that I can't even compare them. The second house was semi attached (big minus in our eyes), which means that it shared one wall with another house. It only had two bedrooms and was too small for what we envisioned, but we chose to see it because it was in a different town where we normally can't afford anything, and this house was in our price range. Other than the somewhat outdated kitchen, the house looked fairly new compared to everything else we had seen so far. Again, it had one bathroom on the second floor. The bedrooms were tiny, but there was a nice-size basement with a workshop area. But our overall impression was... blah. The house looked like a bunch of boxes stacked together. We both agreed that we actually liked the duct-taped windows house better. I think it's something about the character of the old houses that tugs at our hearts. Two weeks ago, I went to an open house by myself because D couldn't make it. This turned out to be very unfortunate because I fell in love with the house. I honestly did not have high expectations going in, as the house was somewhat above our price range and totally not in a neighborhood we had even been considering. But I was learning so much from these open houses that I figured it was worth the trip. Well. The house was pretty much perfect. And by perfect I mean charming and outdated in precisely the way that I loved. It was somewhat bigger than the other houses we had seen, with a great layout. Three bedrooms (all on the second floor), one and a half bathrooms (the half bathroom being on the first floor), and a humongous family room with high ceilings and lots of windows on three of the walls. Fire place in the living room, a window above the sink in the outdated kitchen, overlooking a recently added porch. A backyard with a Japanese oak tree and a large basement with space for a workshop (my dream). Tons of closet space everywhere, and additional storage in the attic. Not a slanted ceiling in site (except for the beautiful, tall ceilings in the huge family room). I looked past the wall paper and the carpeting, and I fell in love. A couple of days later, I came back to explore the neighborhood, which turned out to be more happening than I originally imagined. The sad ending to this story is that by the time D and I were going to take a look at this house together (just a week later), the seller had already accepted someone's offer. I am still trying to emotionally detach myself from this house. On the bright side, I discovered another potential neighborhood. I also started noticing other things that weren't on my radar before, but suddenly became important. For example, I noticed the spacing between houses - do the windows open into the neighbor's bedroom, or is there plenty of space to allow for some privacy (and therefore, a chance to actually keep the shades in your windows open)? Incidentally, this lovely house had plenty of space on either side of it, at least by urban standards. I also became more aware of the natural light and how it enters (or doesn't enter) the various rooms of the house. 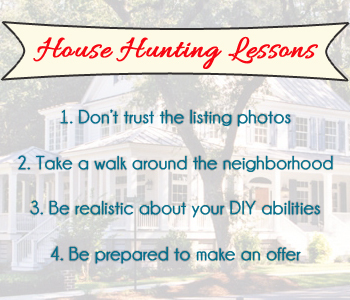 But I guess the biggest lesson I learned was: be prepared to make an offer when you find the right house! Unless the real estate market is completely dead (which it isn't around these parts), chances are you won't be the only one falling in love with your Mr. Right House.